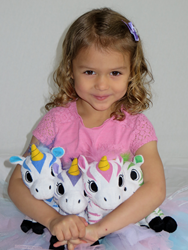 Voted one of the top five in the ‘One to Watch’ category at the 2015 Licensing Expo, Zoonicorn has been building momentum and developing new products to be launched at this year’s Expo, June 21-23, 2016. The interest in these unique and lovable creatures has reinforced for us that the market is ready. Voted one of the top five in the ‘One to Watch’ category at the 2015 Licensing Expo, Zoonicorn has been building momentum and developing new products to be launched at this year’s Expo, June 21-23, 2016. In advance of this year’s show, Zoonicorn will launch three new interactive stories, three downloadable game apps and a new interactive website with parent portal. Launched last year with an original hardcover book and plush toys available on Amazon, Zoonicorn has become a favorite of kids and moms. Zoonicorns are a magical cross between long-time kids’ favorites, a zebra and a unicorn. They share fantastic and encouraging adventures while teaching cherished animal friends important lessons. This spring on the enriched family-friendly Zoonicorn website, kids can read along or listen to stories, including “To Catch a Fish” and “The Tag Along.” Each story has three to five interactive elements on every page and comes with lessons that are shared with parents, from problem solving and taking directions to helping friends. The stories are downloadable on Android and IOS. Kids can also download and print mazes, word finds, coloring pages, connect the dots and other activities on the website. The Parent Zone will offer an Education Corner and Family Ideas blogs for parents. Each story on the site will be paired with a mobile game, available for download on IOS supported devices. “Valeo’s Adventure” will encourage kids to help Valeo adventure through the world of dreams, collect stars and avoid danger. With “Aliel’s Hidden Objects” and “Ene’s Matching Pairs,” kids can help their friends discover hidden treasures as they journey through the winding paths of the Zoonicorn maze. Zoonicorn is created for children 3-8 years old. A character-based family entertainment property, the Zoonicorns come to young animals in their dreams to help them feel safe and learn important lessons. The soft and cuddly Zoonicorn family includes Valeo, the leader of the herd in blue; purple Promithea, who is fun and friendly; pink Aliel is fast and frenzied; and Ene, is green, playful and mischievous. The Zoonicorn original hard cover book and plush toys are available on Amazon. More than just a toy or a book, Zoonicorn, LLC is passionate about developing products that enrich the children’s lives in meaningful ways. The colorful Zoonicorn--a combination of a zebra and unicorn--visits young animals while they sleep and joins them on dreamland adventures. The dream play brings to the animals life lessons that help them through whatever might be troubling them. The Zoonicorns book series was launched February 2015. Learn more at http://www.zoonicorn.com.